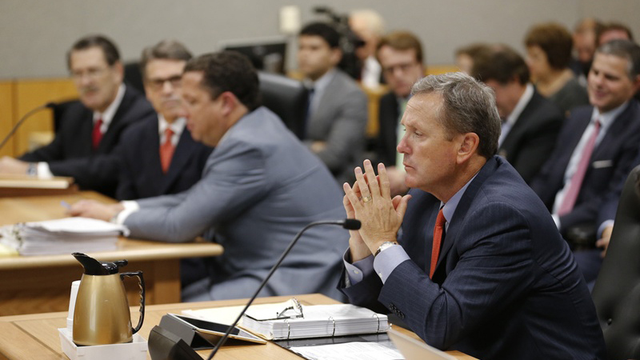 Prosecutors on Friday followed a judge's direction and sharpened their two-count indictment against Rick Perry. Hoping to keep their case from being dismissed, they provided their clearest explanation yet of their case against the former governor. On Aug. 15, then-Gov. Perry governor was indicted on two charges — abuse of power and coercion of a public official — after he threatened to veto funding for the state’s public integrity unit unless Travis County District Attorney Rosemary Lehmberg, who had pleaded guilty to drunken driving, resigned. Perry later made good on that threat, vetoing the approximately $3.7 million per year budgeted to fund the unit. In papers filed Friday in Austin, special prosecutors Mike McCrum and David Gonzalez, amended last year's indictment to fill out their argument that Perry's action was illegal. The prosecutors argue that a governor's veto power is not absolute, and can be misused for criminal purposes. In this case, they contend, Perry's veto threat was meant to accomplish one of two goals: either forcing an independent, local elected official out of office or hindering corruption investigations. Either goal was illegal, they say. "The state will prove that Defendant Perry did not approve of historical and current management decisions regarding the operation of the Public Integrity Unit and therefore wanted to coerce Ms. Lehmberg into resigning her elected position and/or stymie or obstruct the continued operation under Ms. Lehmberg's management," the prosecutors explained. Last month, Judge Bert Richardson ruled that the criminal case against Perry can proceed, rejecting the former governor's defense team's attempt to have the indictment dismissed. Richardson ruled that it was too early in the case to dismiss the indictment. But the judge, who now sits on the Texas Court of Criminal Appeals, outlined defects in the charges against Perry that had to be corrected. The prosecutors complied, outlining how they believe they will prove that gubernatorial veto is not absolute and can be criminally misused. "The State will present evidence that Defendant Perry had control or possession of government funds by virtue of his power of gubernatorial veto to stop the flow of legislatively-authorized appropriated funds," the prosecutors' filing stated. As for the second count, coercion of a public official, the prosecutors said the state will prove that "Defendant Perry is criminally responsible for the communication to Rosemary Lehmberg that unless she resigned from her official position" Perry would veto funding to her office.